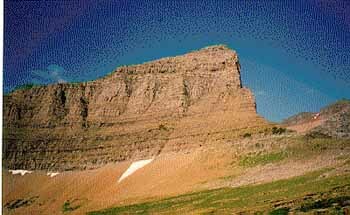 The peaks of Glacier National Park stand as great American pyramids, each carved by wind, rain, and ice. Known as the “Crown of the Continent”, the park gives rise to northern most section of the Continental Divide in the United States, where glacial crests soar to heights over 10,000 feet. To appreciate fully the area of Glacier National Park, one must know something of the uncharacteristic geographical location of the park. Sitting as it does astride what the Blackfeet call the "Backbone of the World" it contains one area in the United States that truly represents the dividing point between three major drainages—the Pacific Ocean, the Gulf of Mexico, and the Hudson Bay. This area is Triple Divide Peak. 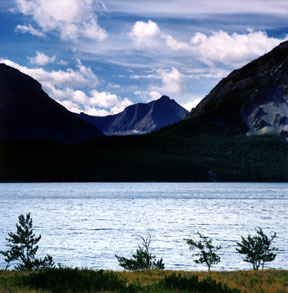 Glacier National Park, Montana is home to two great river divides, the Continental Divide and the Hudson Bay Divide. 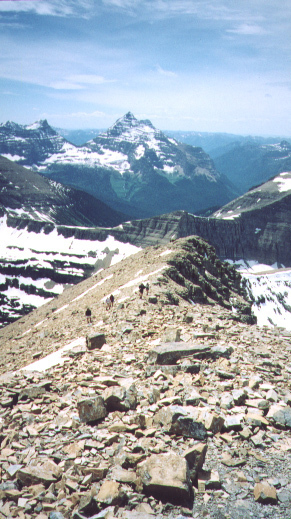 The Hudson Bay Divide joins the Continental Divide at Triple Divide Peak in Glacier National Park to form an apex of three oceans. North America's three great rivers begin on this mountain's flanks. Water falling at Triple Divide Peak will split three ways and end up in the Pacific Ocean, the Artic Ocean and the Atlantic Ocean. Snow and rain that falls in the northeast section of Triple Divide, a relatively small area in the United States located between the Hudson Bay Divide, the Rocky Mountains and the Canadian border, travels to the Artic Ocean. Three small rivers: the Waterton, the Belly, and the Saint Mary flow into Alberta, Canada as headwaters of the Saskatchewan River, which eventually spills into the Hudson Bay and makes its way to the Artic Ocean. Rain falling west of the Continental Divide will flow to the Pacific Ocean. Pacific Creek flows west to the Flathead River and the Clark Fork, feeding the Columbia River, which makes its way across Montana, Idaho, and Oregon before draining into the Pacific Ocean. Moisture from the south side of the Continental Divide goes to Atlantic Creek, which runs east to the Marias River then to the Missouri, which is formed by the confluence of the Gallatin, Madison, and Jefferson Rivers at Three Forks. The water then goes on to the Mississippi ultimately mixing with the tropical waters in the Gulf of Mexico.